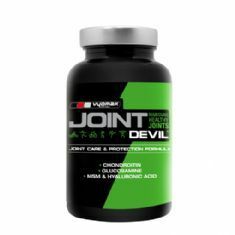 Vyomax® Joint Devil® has been formulated using Glucosamine which aids the synthesis of connective tissue, Chondroitin which lubricates the joints and supports the repair of connective tissue, MSM inhibits the cause of pain and inflammation and Hyaluronic Acid helps produce synovial fluid which lubricates the joints and assists in collagen formation. This product should be taken for least 4 weeks to notice any improvements. Recommended Use: As a dietary supplement, take 1 capsule 3 times a day with meals. Do not exceed recommended dose.